Chanteur, compositeur et producteur Country US né Royce Glenn Sutton le 28 Septembre 1937 à Hodge (Louisiane). Glenn Sutton est décédé le 17 Avril 2007. Glenn Sutton towers among the premier songwriters of the countrypolitan era, having co-written the David Houston classic "Almost Persuaded" and later producing the blockbuster "(I Never Promised You A) Rose Garden" for then-wife Lynn Anderson. 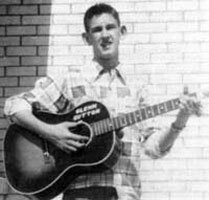 Born September 28, 1937, in Hodge, LA, Sutton grew up in Henderson, TX, and while serving in the U.S. Air Force he moonlighted in the honky tonk outfit Slim Mims & the Dream Ranch Boys. After exiting the service he relocated to Jackson, MS, working as an electric razor repairman and insurance salesman while playing at local clubs. A little-noticed solo single, "Long Tall Texan," appeared in 1963. Sutton published his first compositions through Starday Music in early 1964, scoring a minor hit when Hank Williams, Jr., recorded his "Guess What, That's Right, She's Gone." Later that year he relocated to Nashville, signing as a staff writer with Al Gallico Music. He soon teamed with producer Billy Sherrill, and together they were instrumental in introducing the smooth, pop-influenced "countrypolitan" sound that dominated Nashville in the late '60s and early '70s. Their first major composition, Houston's 1966 perennial "Almost Persuaded," was a number one hit that earned its writers the Grammy for Best Country Song as well as Country Song of the Year honors from performing rights organization BMI. Sutton and Sherrill repeatedly reunited with Houston in the years to follow, and their collaboration yielded a series of additional number one singles including "Have a Little Faith," "Already It's Heaven," "With One Exception," and "You Mean the World to Me." Sutton and Sherrill later teamed on a string of hits for Tammy Wynette, among them the chart-topping "I Don't Wanna Play House," "Take Me to Your World," and "Bedtime Story." Wynette even earned her own credit with contributions to two other number ones, "Singing My Song" and "The Ways to Love a Man." Apart from Sherrill, Sutton teamed with producer Jerry Kennedy to write the 1968 Jerry Lee Lewis country chart-topper "To Make Love Sweeter for You." On his own he also penned the Lewis follow-ups "She Still Comes Around (To Love What's Left of Me)" and "What's Made Milwaukee Famous (Has Made a Loser Out of Me)," the latter inspired by a newspaper advertisement and written literally hours before a scheduled studio session. Sutton also spent a number of years as an associate staff producer at Epic Records, where he helmed sessions for Tommy Cash, Jim & Jesse, and Bob Luman. His most successful Epic affiliation spotlighted his wife, singer Lynn Anderson, whom he wed in 1968. Sutton scored his first number one as a producer with the aforementioned "Rose Garden," written by Joe South. He later wrote and produced Anderson's number one hits "You're My Man," "Keep Me in Mind," and "What a Man My Man Is," as well as the Top Ten entries "Sing About Love" and "Stay There 'Til I Get There." Sutton and Anderson divorced in 1977, around the time he revived his long-dormant recording career for Mercury. 1979's "The Football Card" was a minor crossover hit, and he also earned some attention for the novelty record "Red Neck Disco." Inducted into the Nashville Songwriters Hall of Fame in 1999, Sutton died of an apparent heart attack on April 17, 2007. 1980 SP MERCURY 57001 (US) Red Neck Disco / Hip Hip Hooray for the E.R.A.! 1980 SP MERCURY 57009 (US) The Football Card / ? 1986 SP MERCURY 884 974-7 (US) I'll Go Steppin' Too / ?